Learn to make royal icing flowers with this simple, easy-to-follow tutorial! I am making vanilla cupcakes today for a friend and I wanted to do more than just a white cake with white frosting… so, I decided to try something new! Royal Icing Flowers! Yup – you know those sugar flowers you can buy at the grocery store? Well – you can make them yourself at home… and it’s super easy! The great thing about these flowers is that you can make a lot of them at once… store them… and then use them all year round. You can top cupcakes with these flowers or even decorate cakes with them! Super simple, super fun and super cute! Cut the tip of your disposable bags off and place the piping tips inside. Fill the bag with the Wilton #4 tip with the yellow icing and fill the bags with the #1M tips with the other colors. Place a large piece of wax paper on a flat surface – if you have something to hold the corners of the paper down, do so. Hold a filled piping bag fitting with a #1M tip at a 90 degree angle to the wax paper. Place the tip directly above but not touching the wax paper. Apply firm pressure to the bag so that the icing flows out. Immediately begin to rotate the bag, keeping it straight and continually pressing icing out. After the bag has been rotated about a quarter turn, release pressure and pull the bag straight up. 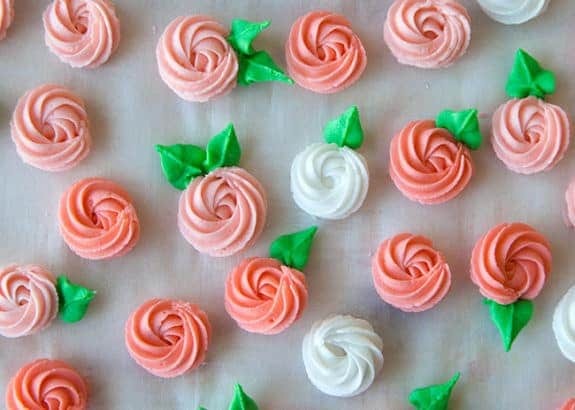 Repeat this process with each color of icing. 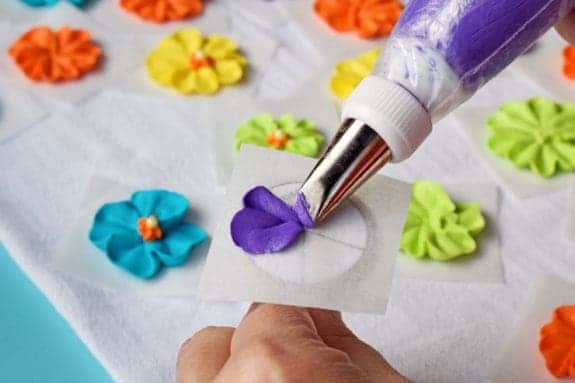 Using the yellow icing with the #4 tip, pipe a small yellow dot in the center of each flower. Let flowers set out over night to dry. After the flowers have set out to dry overnight, store them in an air tight container. If stored properly, they will keep for up to a year. In the bowl of your stand mixer with the whisk attachment, combine the powdered sugar and meringue powder. Mix on low for 30 seconds. Add 6 Tbsp of the water to the sugar and mix on low until it becomes clumpy and all the sugar is wet. 1/2 a Tbsp at a time, add water until the mixture becomes smooth. GO SLOW and be sure not to add too much water. You want a stuff frosting. I added about 2 Tbsp more water at this point, but depending on the temperature and humidity of where you're at, you may need less or more water. Beat on high for 7 minutes. Lift the whisk out, scrape the sides of the bowl and test the texture and consistency of the royal icing. You want a thick icing - but not so thick that you can't push it through a piping bag & tip. Add 1/2 Tbsp of water if necessary to loosen it up. Beat on high for 2 more minutes. Separate icing into the # of bowls you are coloring. 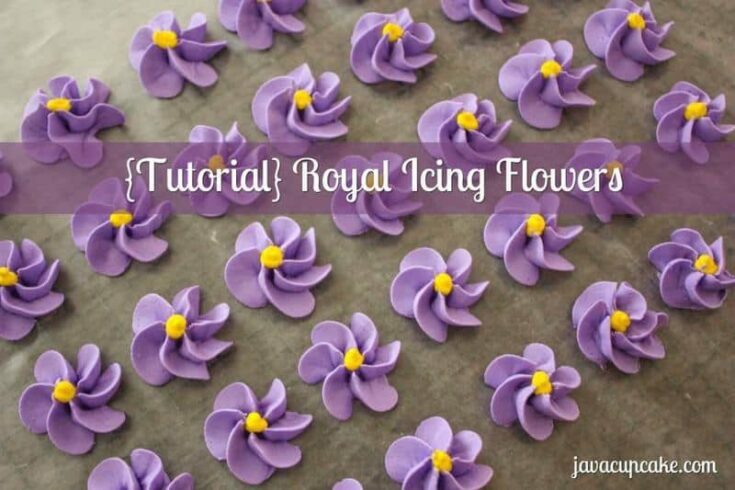 For example if you are making pink and purple flowers, you'll need three bowls of icing. Two for the flowers and one for the center dots in yellow. Using a toothpic, add a very small dollop of gel coloring into each bowl and mix in with a spoon until uniform in color. 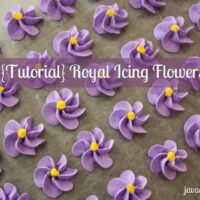 I watched these videos before I made this royal icing to help familiarize myself with the technique. I’ve sat them out for over a day. And the underneath are still wet and stuck to the wax paper what am i doing wrong? And how to store them to keep them from breaking? How is the humidity in your area? That could be the culprit! PS… once they are completely hard, they will store easily in the same container. I had mine for several weeks/months in a tupperware container all stacked up and as long as I was gentle with them, they were fine. If you’re worried about breaking, I’d line a piece of wax paper between layers. 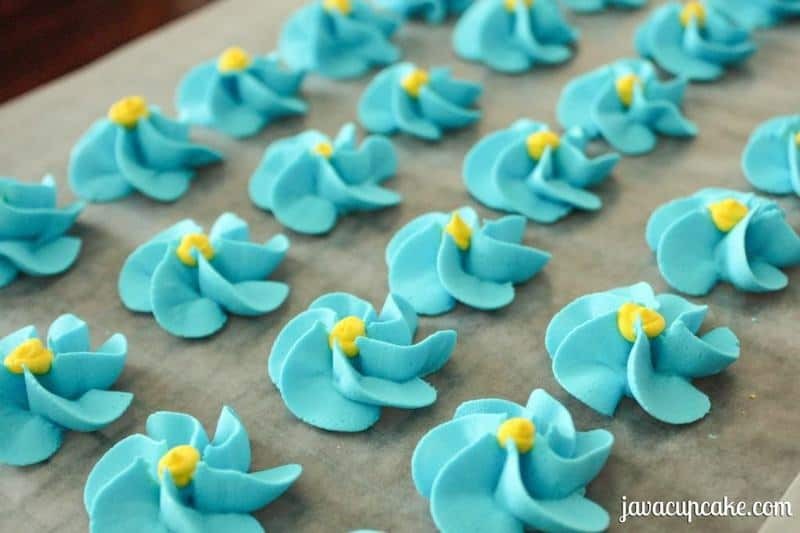 I need help tRYING TO MAKE “BLUEBONNET FLOWERS TO PUT ON MINI CUPCAKES?? Hi Eliz… I’m not sure what you are asking for. Can you be more specific with the help you need? Thanks! After being hard will they soften up when used on a cake? Do you have recipe using egg whites?